In 2011 Subsea 7 was awarded a milestone subsea umbilical, riser and flowline (SURF) contract by national operator Petrobras for four decoupled riser systems to be installed in the Sapinhoá-Lula NE fields located in the Santos Basin, in the largest engineering, procurement, installation and commissioning (EPIC) SURF contract awarded to date in Brazil. The pioneering technology for connecting a large number of wells to a single FPSO was developed by the Petrobras’ research center (Cenpes) and Subsea 7, with the support of UFRJ (Federal University of Rio de Janeiro) and USP (University of São Paulo). The project required the installation of four huge 2,800ton submerged buoys approximately 250 meters below the surface. The system was designed to accommodate a combination of 45 risers/umbilicals for each field in a small area in a decoupled arrangement. Subsea 7’s scope was specifically 27 3.9km steel catenary risers of which 18 were 7.5-inch production lines, three 9.5-inch water injection lines and six 8-inch gas injection lines. Petrobras and its partners selected the Buoy Supported Risers (BSR) system as the most effective solution for the project. Ivan Cruz, Senior Product Manager at Subsea 7, explained that in order to achieve the system’s performance and installation requirements, various innovative technologies were applied. The creation of the Angular Connection Module (ACM) proved integral to the BSR system by connecting the flexible jumpers to the pre-installed buoys. With the large number of risers installed, the buoys can take up different positions and the ACM allows connections to be made at misaligned angles of up to 15°, reliably and safely, reducing offshore hook-up time. Within the BSR system the introduction of the ACM reduced fluid flow to a single interfacing point, thereby decreasing cost and enhancing reliability by eliminating further potential leak paths. 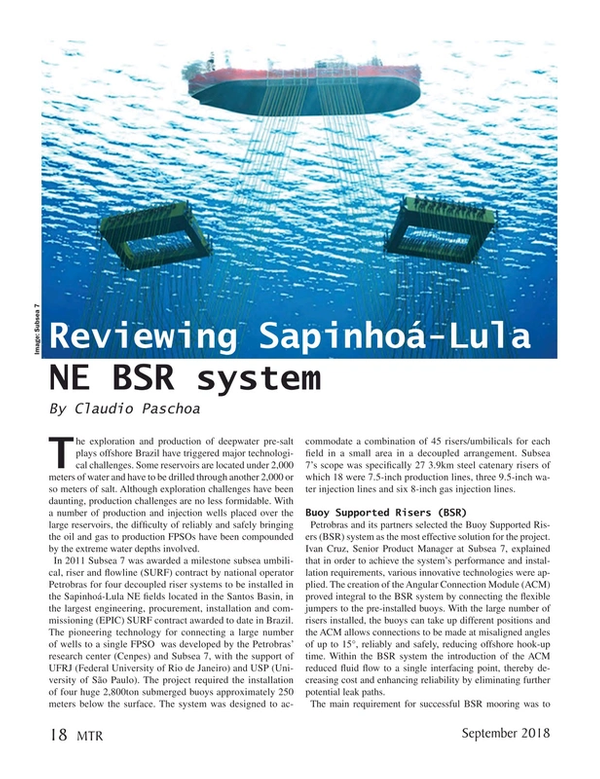 The development of the Sapinhoá-Lula NE reservoirs were major technological challenges. The innovative BSR concept was a unique design in the industry at the time and helped reduce the FPSO riser motions to a very minimal level. With this configuration, the movements of the floating platform are not transferred integrally to the rigid risers, reducing the damage because of the fatigue and guaranteeing their useful life even in severe meteoceanographic conditions. According to Ricardo Francis, consultant of the Management of Technology of Pipes and Risers at Cenpes, the buoys together are responsible for the production of 240,000 barrels of oil per day. “We studied a buoy system to take the dynamics of rigid lines because they internally have a coating that prevents corrosion of the steel due to the presence of gases such as H2S and CO2 and this coating has a more demanding calculation procedure, with the presence of the buoy, the useful life of these lines has increased considerably, making production feasible in the pre-salt fields. From there, flexible lines, called jumpers, are placed that connect the buoy to the production platform. In addition to bringing production to the PEUs, it is intended to absorb their dynamic movements. This is the main idea of the BSR,” he says. With the buoy holding the pipes that conduct the oil and gas from the well on the seabed to the FPSO, it relieves the load applied to the platform. Another advantage is to allow the installation of the risers even before the arrival of the production platform. “The economic advantage was the anticipation of production. If you prepare everything before you get to the production unit it simply connects the risers and you can anticipate 3 to 6 months of production,” says Ricardo. Although there were teething problems in the installation of the first BSR, which led to delays in this first installation, the operators are adamant that the system has been working smoothly and with no major problems since it started operations in 2014 and that similar systems may be used in other deepwater pre-salt plays in future.